Prior to invading Bavaria, Wrangel had dispatched a small column under Königsmarck to invade Bohemia once more. Passing through the Upper Palatinate into Bohemia, destroying all in his path, on 26 July, 1648, Königsmarck appeared before the walls of Prague. Despite his small forces, Königsmarck was able to enter one quarter of the city, the Kleine Seite. This was because the place was betrayed into his hands by a former Imperial officer. Despite possession of a portion of the city, and later reinforcements received under Karl-Gustav (later Charles X of Sweden), the Swedes were unable to take the remainder of the town. The most valiant defenders of the place were the young Bohemian students of the Caroline University, led by their Jesuit preceptors. The stalemate was only ended by the arrival in November, 1648 of the news of the conclusion of the Peace of Westphalia. The Battle of Prague in 1648 was the last action of the Thirty Years' War. General Hans Christoff von Königsmarck, commanding Sweden's flying column, entered the city and captured Prague Castle on the western bank of the Vltava river. 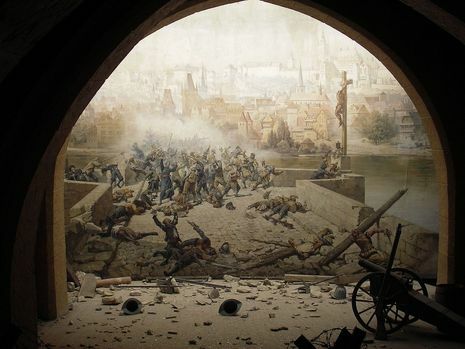 The Swedes attempted to enter the Old Town on the eastern bank of the river, but were repulsed on the Charles Bridge. Unable to enter the city, the Swedes settled for looting the Castle. Many of the treasures collected by Emperor Rudolf II (such as the Codex Argenteus) were taken to Sweden.